Cynopsis Digital Awards Luncheon Announcing Digital Model D Winners and "It List"
The sold-out, 5th annual Cynopsis Digital Model D Awards took place at ThreeSixty in TriBeca New York. Hosted by Oilver Trevena, the lunchtime event was a “who’s who” of digital, with comedic relief from Trevena and guest presenters The Gregory Brothers ("Songify This"), Cathy Kelley (WWE), and singer/comedian Randy Rainbow. In the media industry, digital is a dazzling disruptor that demands new technology, fresh formats, and a pioneering spirit. The winners and finalists in this year’s Cynopsis Digital Model D Awards exemplify just that, displaying excellence in online video content and advertising. Same goes for this year’s Cynopsis “It List “ – we put out the call for the most innovative executives in digital media, and heard about imaginative marketers, masters of OTT, measurement gurus and much more. Digital Model D winners were recognized in more than 40 categories that spanned content, marketing, talent, tech/tools and more. Winners included: 1620 Media, Adobe Advantage, Bleacher Report, Boingo Wireless, Bravo Social Media, Channel Factory, CobbleCord, Complex Networks, Disney ABC Television Group, Driver Digital Studios, E! Entertainment, First Media, Food Network, GlassView, Hulu, IFC, Intersport, The Madison Square Garden Company, MKTG, NBC Sports Group, NBCUniversal, Nickelodeon, One Solution, PGA TOUR, Red Bull Media House, SapientNitro, Scripps Lifestyle Studios, ShoulderHill Entertainment, Sony Pictures Television, Spike, SYFY Digital, Turner, Viacom Velocity, WE tv and WWE. Click here for winner category details and more! 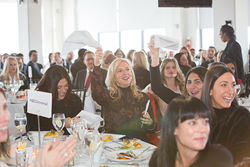 "We are very proud that our partnership with Bed Bath & Beyond generated such high performance and won the recognition of the digital marketing community during the Cynopsis Digital Model D Awards luncheon. We believe that the secret for exceptional performance in the social media space is combining strong, highly usable content with brand messaging and presence. This allows audiences to resonate and gain value from the content, and provides visibility and recognition for the brand," said Guy Oranim, CEO and Founder of First Media, winner of the Best Branded Web Video category. A sampling of “It List” inductees included executives from Callaway, Crackle, DigitasLBi, Horizon Media, Mediacom, Starz, Sweety High, and Turner, to name just a few. To view the 2017 “It List” honorees and Model D Award winners + honorable mentions, click here. Missed this year's Model D Awards? Be sure to save the date for next year as the call for entries will begin in the Summer of 2018. Cynopsis is what the TV industry reads first every day. The Cynopsis family of products includes the media industry's most-read daily, Cynopsis, plus sister dailies Cynopsis Digital and Cynopsis Sports, the Cynopsis Jobs board and special reports. Serving TV, agency and brand professionals, Cynopsis Media produces conferences, webinars, and awards programs that are second to none. Find out more at cynopsis.com.